If you know me at all you know I really don't like going anywhere alone. And actually eating alone....forget it. But since one of my goals here is to push outside of my comfort zone and because I was really, really hungry, I made an exception last week in Dublin. I'd taken a train early in the morning, which was very exciting! I even made the condutor take my picture. 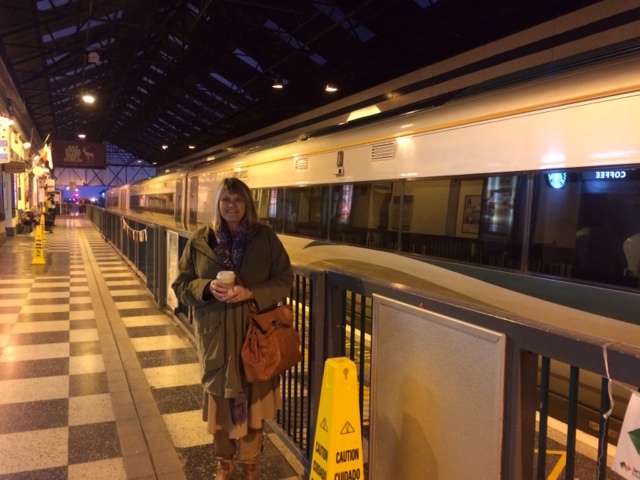 I'd gone directly to the RTE national studios there to be part of a political panel discussion on American politics an I hadn't bothered to eat anything but a cup of coffee on the train. So after walking down Grafton Street, because it's so entertaining, seriously filled with street entertainers I saw a sign for rooftop dining in a cafe above the frey. So I climbed the stairs to find a little cafe, ordered fish and chips and sat along the rooftop edge. it wasn't more than five minutes until this guy joined me. He got all of my chips, one at a time, and half my fish. But it was well worth it for the company. A child at the table next to me kept pointing at me and his mother said I was an American, and we shouldn't feed the birds. Actually, I am an American, but more than that I was just lonely.